Going along with the theme of "plants on display in the lab room of a course I TA," I have a series of three different, yet closely related, plants for this blog. The first one is a plant I've blogged about before, and the next two are unique (and I didn't even know they existed until I started with this course; now I'm trying to track them down to plant them in my garden somewhere!). The first image shows all of them together so you can get a bit of perspective about size difference and how they differ from each other on a "big picture" scale, then I'll profile each one of them separately. This image gives away a bit of the surprise (hindsight: take the cardboard cheats out of the way before photographing next time! 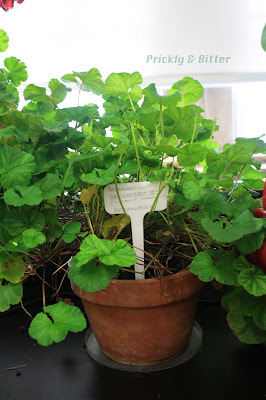 ), but the major difference between these three species of geranium is how they smell. The one in the middle is the "ordinary" geranium, and the pots on each side are geraniums that each have unique smells that I force the students to identify (I'm awesome like that; I make my students use their senses in labs...I even make them taste plants! Don't worry, I ask about allergies at the very beginning so I don't kill anyone by accident). So let's get smelling! This first plant is probably the most easily identified species of any kind of geranium because they're so gosh darn common! Especially in North America, it seems like everyone, everywhere has planted at least one geranium plant in their garden in the spring (some climates in North America in the southern United States would provide ideal growth conditions to allow for the growth of geraniums all year; they are perennial plants in ideal conditions). The colour of flowers can differ drastically, as can the shape and general morphology of the leaves of the plant. 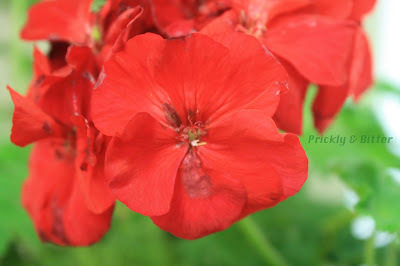 The common geranium is native to southern Africa, where it is actually now nearly threatened in the wild because of habitat loss and the increasing frequency of severe drought. I have blogged about this plant twice before in two different forms; you can read all about the two cultivars HERE and HERE. The easiest way to identify a "regular" geranium is by looking at the leaves (very fleshy and almost furry on both sides) and the flowers (the characteristic five petals with the stigma in the middle that's star-shaped; you might need to click on the image of the flower to make it larger to see it). Since other species of geraniums are less likely to flower both in general and in captivity (putting other species of geraniums in pots makes them significantly less likely to flower, but they do also have different flowering times so they might not have been "in season" at the time I took these photos), we'll concentrate on the leaves as methods of distinguishing these species. You can see right away that this species is quite different from the previous, "common" geranium in two ways. The first one is the way that the plant grows. Instead of it being a low, bushy plant, it instead grows thick, woody stems and the leaves are concentrated at the top of these stems. 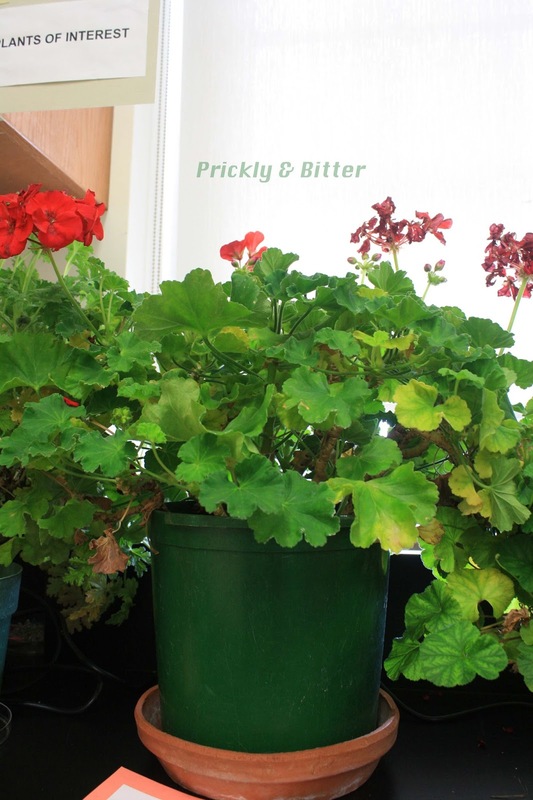 This is partly attributed to the general differences in growth habit of these species, but also a difference in breeding; the common geranium has been selectively bred over centuries to maintain a "low and bushy" growth form because it is more pleasing to gardeners. If you let the plant grow long enough indoors (or live in a climate where this species survives year-round), you'll notice it start to get taller and more wiry as it ages. Pruning can prevent this by keeping the plant short, but since the flowers only emerge from the top of the plant pruning is generally discouraged. It's much easier to just rip it out and replant it if you want to keep it short, or just learn to love a straggly geranium bush. This species is also native to southern Africa, but is much more common in the wild because of its natural defence mechanism: the scented leaves. The plant hasn't just developed this ability to please humans; it has actually evolved as a way of deterring herbivores from eating the plant. The regular hairs on geranium leaves are called trichomes. 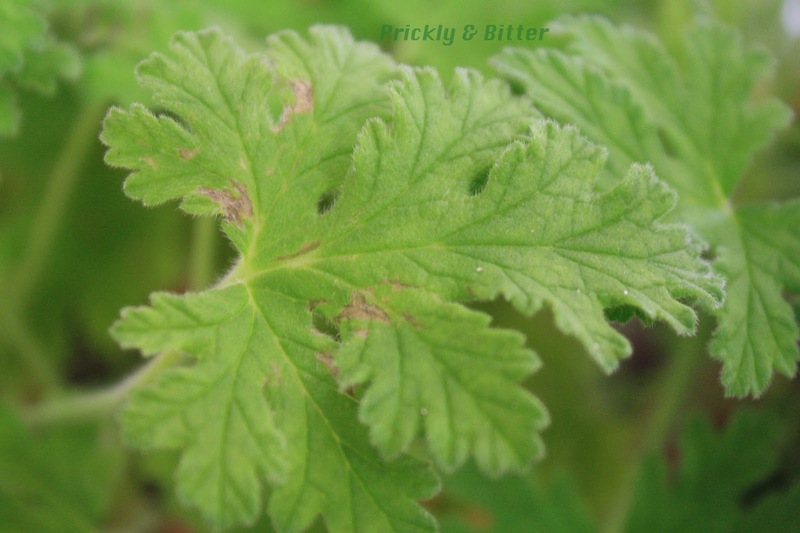 The lemon scented geranium also has these trichomes on the leaves, but they also have specialized trichomes called glandular trichomes. These have a swelling at the tip of the hair that contains a tiny droplet of oil. When we separate the bulge from the rest of the hair we get this over-powering smell of lemon (the scent is very similar to Lemon Pledge, if you've ever used that for dusting then you'll recognize the smell immediately), but to a herbivore this means "STAY AWAY!" If a herbivore is silly enough to consume the leaf anyway, then they will in all likelihood be killed (if small) or learn to never do that ever again (if they're larger). The oil droplets contain potent chemicals that are toxic in large quantities; humans would have to ingest an entire plant in order to feel any ill effects so you don't have to worry about any accidental poisonings if you happen to own this plant (there is no reported toxic effects on cats and dogs, but you might want to play it safe and keep them away from it anyway). You will want to be careful, however, with this plant around very young children as the oil in the droplets can be very irritating to sensitive skin (and babies and young children generally have the most sensitive skin, especially on their hands, arms and face). As an aside (a relevant one): I have chewed on one of these leaves just to "try it out," and let me tell you. Not a pleasant experience. It doesn't taste AT ALL like it smells. Word to the wise. The overall leaf shape of this species is also very different than a common geranium. 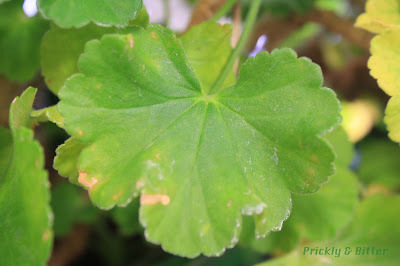 The leaves are much more lobed than the common geranium, and there is a notch (or a "crisp," where the Latin name of this species comes from) at the end of every leaf vein. 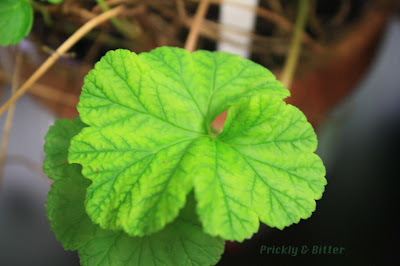 They are still fleshy like the common geranium, but another difference between them is that this leaf is much longer than it is wide, where the common geranium has almost a round leaf and at times even wider than it is long in some cultivars. 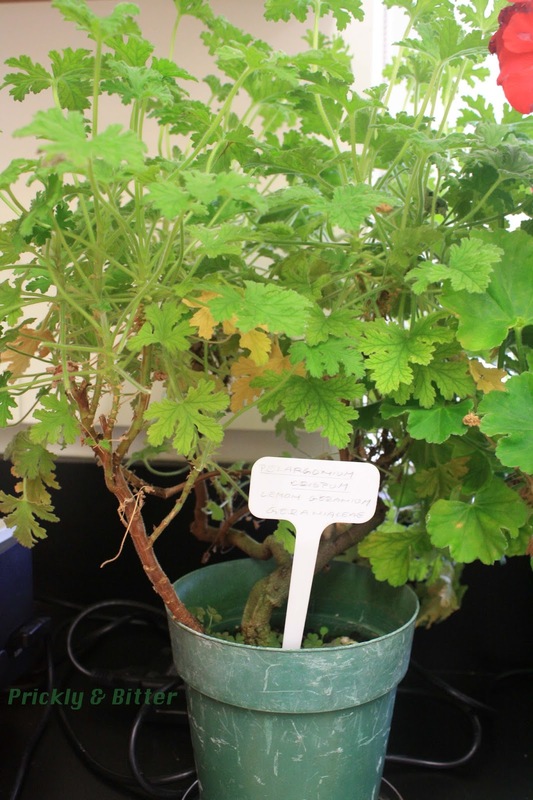 The last plant we have as an example of the diversity of growth form in geranium plants is the coconut scented geranium. This species, also native to southern Africa, is much more common in the wild than the previous two, but not much is actually known about its current state of population abundance and successful reproduction. As it does share a native range with the previous two species, it can be assumed that this species would also be threatened by habitat loss but it can also tolerate much more harsh conditions than the previous two species; it can tolerate growing in really rocky conditions with little soil because of its vining growth habit. 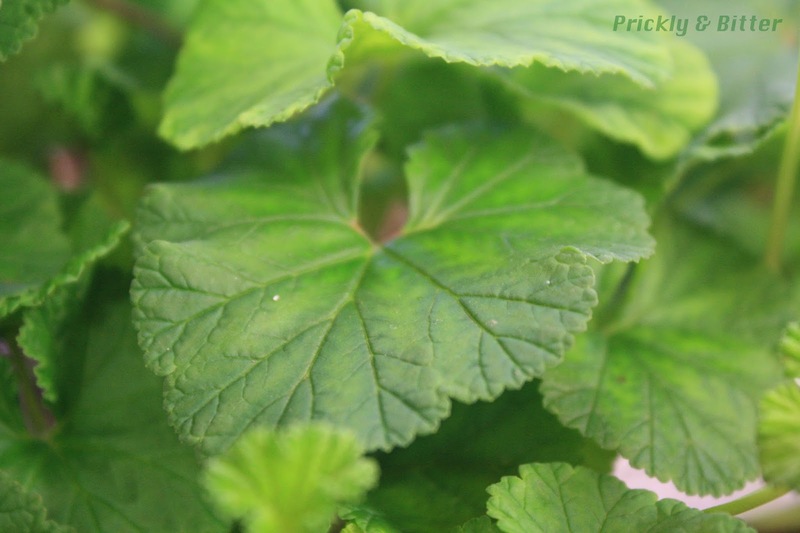 The leaves of this species look very similar to the common geranium, but aside from the smell there are a few differences that you can look out for. The first is the texture of the leaf. Instead of being thick and fleshy, this leaf is much thinner and "normal-looking" (which can be seen in the lower photograph where there's a leaf I just happened to catch straight-on from the edge of the leaf). Also, the upper surface of these leaves are completely smooth, unlike the furry upper surface of the common geranium leaf (which may actually vary in hairiness, depending on the cultivar, but will always have at least some hair on the upper surface). The lower surface of this leaf is where all of the glandular trichomes are located. The leaves of this species are also unique in their coloration, regardless of the maturity of the leaf. When very young, the leaf will be much darker green around the leaf veins than anywhere else on the leaf. As the leaf ages (from the middle picture to the bottom one), it becomes much more uniformly green but if you look closely you can still see a bit of a difference in "green-ness" in some areas of the leaf. The last difference with the leaves is the margin or the edge of the leaf. 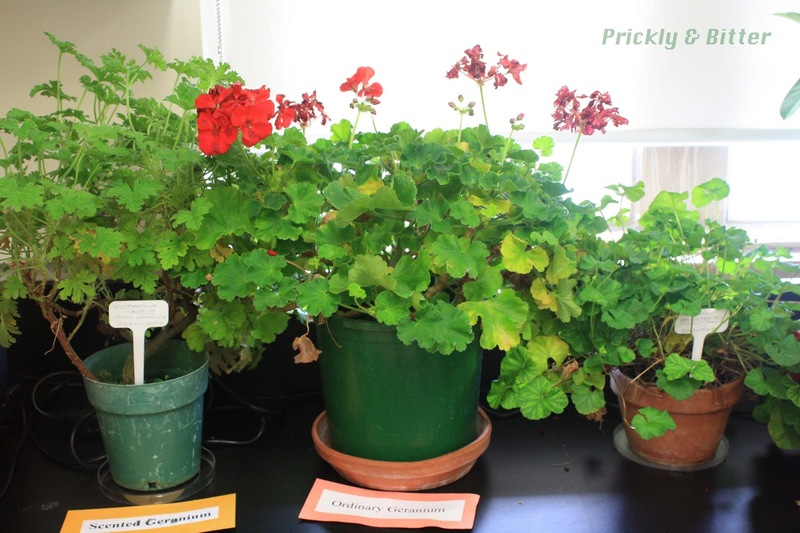 This is a comparison that actually should be avoided, however, as the margins of the leaves of the common geranium can look drastically different based on cultivar. One of the most easily observed differences between these two species is the growth habit. This species almost entirely lacks a stem; instead there is a dense mass of tissue near the soil level that acts as a stem, and the leaves emerge directly from the level of the soil. All of the above-ground mass is composed purely of leaves. As the plant wants to explore more territory to find more resources, it will create underground rhizomes that will seek out pockets of soil to establish a new basal stem mass to grow new leaves. This rhizome can traverse rock surfaces if needed, and where it is above-ground it will look nearly black because of all of the melanin (yep, the same chemical that your skin makes as a result of skin damage; we refer to this melanin production as "getting a tan") that is produced in the rhizome. This acts as a UV protectant, and can prevent damage to the rhizome as a result of exposure to the sun. Deeply pigmented plant tissues are also generally avoided by herbivores, as digesting melanin is a difficult process and may actually be a toxic process to some insects. I have also tried chewing a leaf of this species, and also not an overly pleasant experience. Gives a much more "fuzzy tongue" experience, so I'm guessing this would suggest it would be toxic in smaller quantities to humans. It would still involve the consumption of a LOT of the plant to produce any kind of ill effects, but best to keep this one more out of the way of children if you can. On the bright side, the essential oils produced by this plant are much less irritating to the skin!